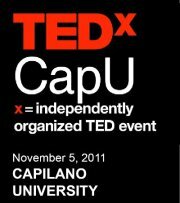 On Saturday, November 5th, 2011, Capilano University hosts what promises to be a very forward looking TEDxCapU event (x=independently organized TED event). This event is all about the impacts of change on our businesses. 384 of Vancouver’s movers and shakers”� entrepreneurs”� business leaders”� and distinguished guests will come together to share ideas, uncover possibilities and stretch brains. Thousands more will participate via live streaming, twitter and website access. 9 incredible speakers will be framed with TED Talks, live music, art and networking. The speakers are industry leaders, innovators and creators. 2 speakers will be competition winners from the Capilano University student/alumni body and the BOSS Self-employment Entrepreneurship Program.